There’s only one word for my first visit to Seoul: Romance! Perched atop Namsan Seoul Tower is an observation deck overlooking the most breath-taking view of Seoul. Upon it, flourishes what Seoulites call The Locks of Love. It’s a crazy tradition that spans the globe and that Seoul youth started at Namsan Tower in the hope of bringing friends and romantic partners up to the observation deck to join their lockets in an unbreakable bond. Some lockets are inscribed by pen or engraved, some have pictures, stickers and some lock formations have even mutated into add-on barnacles! The observation deck fences are virus-clothed with them in mass sentiment of what the Korean heart draws forth and wants to keep near. Taking in this be-speckled sight of heart-felt feelings, I couldn’t help but find a magic in it all. And within this short time, as I looked out over the sprawling metropolis, something in me clicked into the city. Perhaps it was the millions of locks, gleaming in the sunlight as small reminders of romantic Korean hearts. Maybe it was the sunset, the new friends I made, sightseeing Seoul from the back of a scooter (an awesome way to see Seoul! ), or the calm reflection that comes at the close of a great weekend of sightseeing in this city. Whatever it was and as corny as it sounds, a gentle poetry entered, letting me know the rough edges I hit in Korea would turn out alright. My new friend was Seoul and now we had a memorable bond, which wouldn’t break. I recommend taking the cable car up to the tower. It’s a nice ride and pretty scenic. Check out the gift shop for some cute momentos of Namsan Seoul Tower like stuffed animals, keychains and cutesy memorabilia to remind you of your trip to Seoul. There’s a revolving restaurant on the tower- food is pricey but if you’re there with a special date, it has potential to be quite romantic. If you go during winter, go to the convenience store while you’re there and buy a few heat packets for your hands. They’re ultra-useful. They cost around 1,000won and will heat up any pocket they’re in. Hours: 10am to 11pm; Fri -Sat 10am-midnight. Also, from 7p- to midnight, the tower lights ups . Check schedule of events here. Where to Stay : Decent list of hotels and hostels near to Namsan Seoul Tower. It is not possible to drive to Namsan Seoul Tower, so the only options are either walk, take a bus or a cable car. Getting to Seoul Tower by cable car offers the opportunity to enjoy a nice view of Seoul and of Namsan Park. You can get to the cable car station by getting off at Myeongdong Station (Line n. 4, exit 3) and walking for ten minutes from the subway station. Take a bus at Chungmuro Station (line n. 3 or 4) or at Dongguk University Station (line 3), which will take you to the parking area of Namsan Seoul Tower. Buses run every six minutes from 8am until midnight. Or take the city bus tour which goes there directly and stops along other famous landmarks in Seoul. Walk 30 minutes from exit 3 of Myeongdong subway station (Line n. 4). 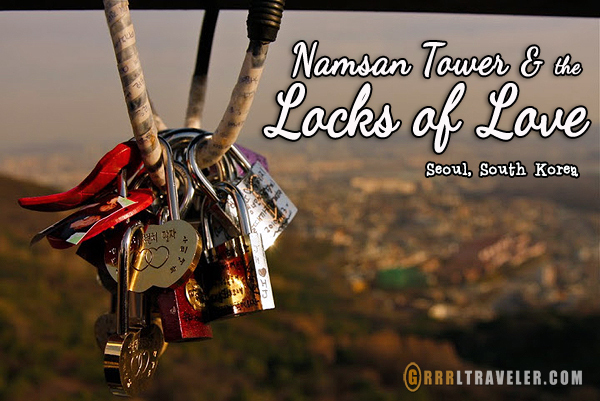 Have you been to the Namsan Seoul Tower or the Locks of Love in Seoul? Seoul is really nice at night, especially from the N tower observatory. I went on tour with a really nice local agency onedaykorea to see the best night view of Seoul city, and it was really nice. i visited seoul before but not during the night, but i am glad i did. Seoul at night gives off a totally different vibe. I highly recommend that you spent one night observing few nice places of Seoul being enlightened in pitch black. You’ll be surprised. I would spend all day reading the locks! @Jo: I wish I could read Korean. I’m sure the messages are wonderful! gosh! i’m amazed with the locks of love things. makes me wanna see it myself, hahaha..
Sweet post! Love visiting the locks also- I think it’s a special place too. Is that where they did the episode of Amazing Race where they had to find the lock that matched a key they were given?? no wait I just Googled it, that was in China. @Laura: OMG– if that location were the place, that would be quite a challenge. I’ll have to see if I can’t see some of that episode that you saw tho. It sounds fun!